Ty introduces Bo™, the newest member of the Beanie Babies® plush toy family! 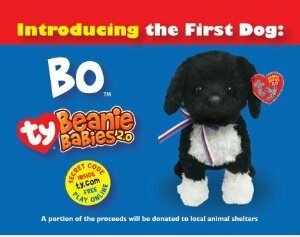 Bo the Beanie Baby is an adorable black and white Portuguese Water Dog that will capture the nation’s heart. Bo was inspired by the First Family’s new puppy. “We are very proud of the First Family and wanted to join in celebrating their choice of a family pet. Now everyone can own a little Bo Beanie Baby 2.0 and join in the excitement,” said Ty Warner. Bo made his debut on April 16th in select specialty retail locations and sold out within hours of hitting the shelf! Bo the Beanie Baby retails for $4.99 and is sure to be a hot collectible. Already Bo is selling for $100 on eBay. Bo comes with a secret code that unlocks a fun virtual world at http://www.Ty.com. Beanie Babies 2.0™ are created in conjunction with their own interactive virtual world and are designed to appeal to people of all ages. Beanie Babies 2.0, available now at Ty retailers worldwide, have a suggested retail price of $4.99. With the purchase of Bo, Ty is donating a portion of proceeds to local animal shelters. Bo the Beanie Baby offers a wonderful opportunity to recognize the importance of animals in our lives.